For most, it seems the decision to cloth diaper is typically based on one of two primary reasons- the amount of money to be saved by using cloth diapers or that they are more environmentally friendly-no chemicals and less waste. But for some, the cuteness of cloth diapers-while not necessarily the key factor- also plays a deciding role. 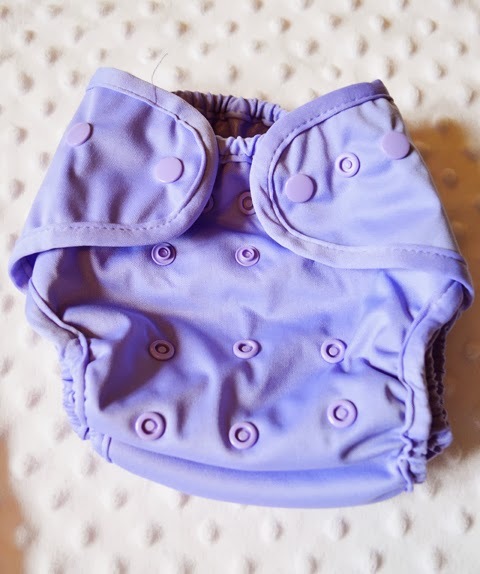 Today I am excited to share with you a diaper that I personally think happens to be one of the cutest in the market- Buttons Diapers. 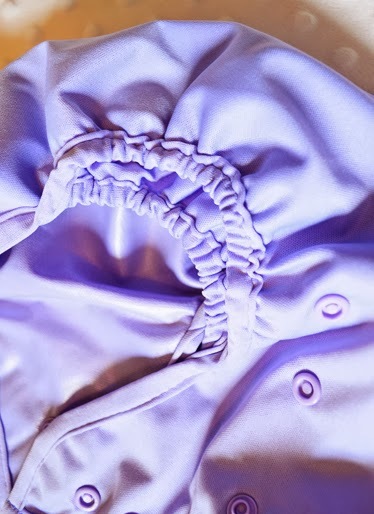 For this review, I received a diaper cover in lavender, daytime diaper insert, and nighttime doubler insert. Buttons Diapers are a two-in-one system featuring a waterproof cover and snap in inserts. The covers feature two layers of soft, easy to wipe PUL. My first thought upon feeling the cover was that the quality was wonderful. Unlike some diapers I've seen where the PUL seems quite thin, these are thicker and feel as though they would do better to prevent leaks. The cover also features double gussets on the legs to further prevent leaks and for a better fit. It seems one of the more common fit issues many face with cloth diapers is around the legs, so this is a great feature. They are one size, fitting babies from 9-35 pounds. They fit our 4 month old very well!! The inserts have 4 layers of absorbent microfiber and a top layer of fleece to go next to baby's skin. They are quite thick and absorbent, but still offer a trim fit. They have two size options- small for babies 9-20 pounds and large for 20-35 pounds. This helps to provide a great amount of absorbency, while still maintaining that trimmer fit. The inserts snap in conveniently to keep it from sliding around. For nighttime diapers the doubler is perfect- adding 6 more layers of microfiber! These can be snapped to the insert as well as the insert. Because these do not have a fleece layer, they can only be used in addition to the insert. Using both does make the diaper quite bulky, but for those nighttime diapers that can actually last through the night, that doesn't bother me at all. We have very few diapers that work well for overnight, and this is certainly among them. This particular type of system with covers and inserts happens to be one of my favorites. I like that the cover can just be wiped down and insert switched out...meaning less laundry & faster drying time, more budget friendly and when traveling, they tend to take up less room. But I also like versatility, so I decided to try out some of the inserts I'd already had with the Buttons cover. Though the Buttons inserts certainly work best because of the snap in feature, I found that the other inserts worked really well too. Or if you're more of a prefold and cover person, the Buttons cover serves as a great cover for that too. (I even tried the doubler in a pocket and found it worked well for that too.) I do love the Buttons inserts myself, but I love that I can mix and match a bit too, since we all know that not all insert/diaper combos work for all babies. As mentioned above, I personally think that Buttons Diapers happen to be one of the cutest options out there. They are quite simple- no fancy patterns or prints, but the colors are beautiful-not too bright, but not too light either. I love the lavender we received, but would love some of the others as well- particularly Pebble. This seems like a wonderful gender neutral color, and I just love it. But the cutest part of all? The sweet little button embroidered on the tush! So simple, yet so absolutely adorable. I love it. One of the things that I love about this type of system is that they are very budget friendly...and Buttons is no different. The covers cost just $11, inserts $3.50 and doublers $5. Because you can change out just the insert if baby has only peed (or mess is contained in the insert only), you can purchase fewer covers, with more inserts. The quality of these covers are amazing, and the price is cheaper than many others I've seen. These are a great option for anybody, and really could fit any budget! It is recommended to have 8-10 covers, 18-24 daytime inserts and 2-3 nighttime inserts, which makes for an investment of around $240! Considering the amount you would spend on disposables, that's a huge savings. The only real downfall cost-wise is that you would have to buy new inserts once baby outgrows the small size, but the size range is quite broad and the savings is still tremendous. And one very lucky winner is going to win a Buttons diaper cover and two daytime inserts in their choice of size and color!! Enter using the Rafflecopter form below. I would love the pebble color. Double gussets are key, I'd love to try this diaper with my daughter! Pebble would be so versatile!! Would love it! I would follow your blog via GFC, but every time I try to the link doesn't work. I love the lavender or the strawberry! They are both very cute colors! I would choose the strawberry. Ooh really love pebble and banana cream. I like the pebble color the best. I really like the Peddle one! i love pebble too! its a great unisex shade you dont see often! I like the Strawberry color! I would love the Blueberry color...too cute!! I like the lavender one most. I would choose sweet pea! I would probably choose the snow color. I would choose the color Apple. I also love Tangerine and Pebble! I finally own a Sweet Pea!! I like lavender and strawberry best. I love the lavender... but I would pick banana cream! I love the lavender and it would likely be my first choice! I like the Pebble color for my for grandson. I'd love the banana cream color. I would choose the Apple color if I won! Hard to choose but maybe Tangerine? I would choose Pebble, love that soft grey! I think I would go with Strawberry for my baby girl! Great post. I really like your post. You have too many cloth diaperproducts. I am glad to come accross you relevent post.